Mick Sell Racing :: Win in the Group 3 Lord Reims Stakes! Win in the Group 3 Lord Reims Stakes! ENCHANTING Waters showed her Adelaide Cup credentials with a strong victory in the Group 3 Lord Reims Stakes (2600m) at Morphettville yesterday. The Victorian mare sat just off the pace before letting down nicely, giving Kyneton horseman Mick Sell the biggest win of his career. This was the first Group victory for Sell, who has been training for three years and has a team of 20 in work. With such a good performance in the final lead-up race, he now has a top chance in the $400,000 Group 2 Adelaide Cup on Monday week. Because the race is penalty free, it means Enchanting Waters will not be rehandicapped and gets into the 3200m event with just 53kg. "Everything has fallen into place but it's a big race and anything can happen," Sell said. "I think we've just got to keep her maintained, she's ready now." Veteran jockey Craig Robertson gave the Dolphin Street seven-year-old a perfect run in transit, sitting one-out and one-back. Favourite Rialya took up the early running, but Shayne Cahill gave up the lead down the back straight as Dumosa and Danahere increased the tempo. With Rialya pocketed on the turn, Robertson eased to the outside and quickly had the others covered, pinching a break over Lloyd Kennewell's stayer and holding on to win by 2¼ lengths, while He's Hot To Trot ran on well for third. 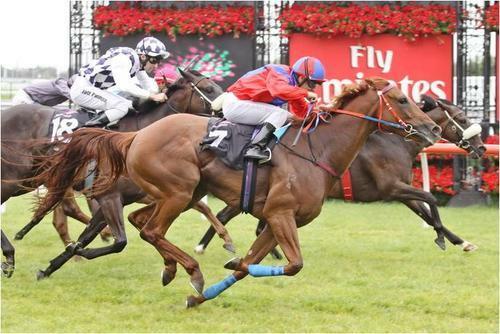 Morphettville has been the scene for Enchanting Waters' previous Black-Type success, a third placing in the Listed Birthday Cup last month, while she finished second in the Listed CS Hayes Memorial Cup (1600m) in 2010. "Since finishing second in the CS Hayes two years ago, she's done two tendons, but she's come back really well," Sell said. "Robbo rode her a treat, he had her settled beautifully right through the run." The victory completed a double for Robertson, who saluted earlier with Robbie Laing's Xavier. The other highlight of the day was fledgling trainer Sam Kavanagh, the son of Melbourne Cup-winner Mark, who tasted success with his first runner Meshmaker. The smart three-year-old, who is on a SA Derby campaign, whipped around the field to take out Mo Barry's 80th Birthday Handicap (1529m) in fine style.